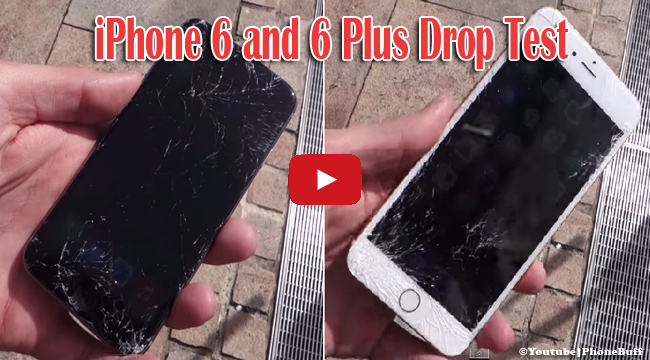 A viral video of entitled ‘iPhone 6 and 6 Plus Drop Test!’ has now been circulating around the various social medias just a couple of days after the iPhone 6 and iPhone 6 Plus had been introduced in the market by Apple Inc. The said video had now garnered more than 6 million views since it was posted on September 18. In his YouTube account named PhoneBuff, Davis Rahimi, posted his video of testing the durability of the said new models of iPhones. He first dropped the iPhone 6 and iPhone 6 plus on their backs. Both phones sustained minimal and barely noticeable scratches. When iPhone 6 was dropped on its side, there was a little scratch and no dents. The iPhone 6 plus, however, was shattered which would make some viewers cringed. The small pieces of the shattered bottom edge of the screen seemed to come apart. While the phone does still work, Rahimi clearly said that it failed. When Rahimi dropped the iPhone 6 on its face or screen, it sustained heavy damage. There are noticeable cracks and the seamless design seemed to come apart though the phone still works. The iPhone 6 plus was dropped next. Unlike its previous drop, it seemed less damaged from the face drop. PhoneBuff has now more than 300,000 subscribers and he promised to post more coverage on the iPhone 6 and iPhone 6 plus. Meanwhile, Android Authority, with more than 800 thousand subscribers, also posted a video of the same tests of back, side and fronts drops of iPhone 6 and iPhone 6 plus. In this video, also posted on September 18 and garnering more than 800 thousand views, the screen of both phones neither cracked nor shattered but only sustained small scuffs. These videos aimed to prove the sustainability and durability of the iPhone 6 and iPhone 6 Plus but got very different results. Results could have varied on the way they had dropped the phones or on what kind of pavement the phones dropped into. If you would be asked, which one is more credible?